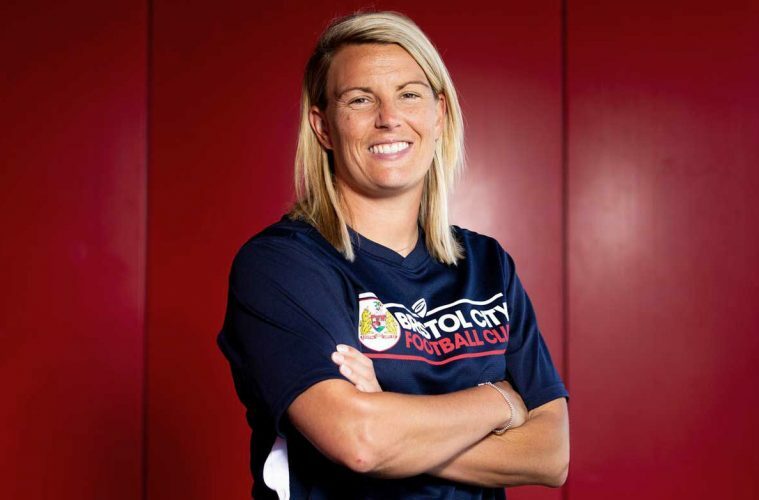 Australian Tanya Oxtoby faces her first FA Women’s Super League match against Brighton & Hove Albion this weekend with her new side Bristol City. Oxtoby took over in the summer after a spell working with Marc Skinner at Birmingham City as well as a playing career that included playing for Doncaster Rovers Belles. Oxtoby has two Continental Cup matches under her belt already — a penalty shootout defeat to Leicester City and a victory against Sheffield United. Despite a positive start with lots of new youthful signings still getting used to life with the Vixens, Oxtoby is still getting used to life as a No. 1. City finished eighth in their first season back in the top tier last season, just clear of Everton and well ahead of bottom side Yeovil Town. But a big summer overhaul has seen manager Willie Kirk depart for pastures new at Manchester United while the club has also lost top scorer and England superstar Lauren Hemp to Manchester City. Kirk took on a bold approach in terms of attacking the opposition, whoever they were, though it didn’t always ensure the best of results for the team. Oxtoby still wants to employ a similar style of play but admits her side have to become “hard to beat”. Few coaches within the FA WSL know how to work a style of football that mixes impressive attacking play with a solid defense like Birmingham’s Marc Skinner, who Oxtoby spent last season working alongside. And the new Bristol City manager admits Skinner has had a big influence on her as she steps into the hot seat this season. “Marc’s excellent,” she said. “He’s got one of the best footballing brains and the level of the detail he goes into is exceptional. Having that experience with him and getting to see how he works day in, day out was vital for me. Oxtoby has instantly taken a leaf out of Skinner’s playbook by recruiting and giving opportunities to young players. “Our young players are a part of that and we want to keep them here for two or three years so we can develop them. They’re such exciting talents and they want to learn, they want to be better. They’re in every single day asking questions. And former Millwall forward and England youth international Rutherford is one player Oxtoby is particularly excited about. Oxtoby will walk out as a league manager for the first time this weekend when Bristol go to newly promoted Brighton, managed by former England head coach Hope Powell. With games against Chelsea and Manchester City set to follow, Oxtoby admits Brighton is a game her side have targeted to get early points on the board. In terms of the wider picture, the Australian is looking to improve on last season and ensure her players gain experience across the whole season, both on and off the pitch. “We have our internal goals that we’re working towards and being successful in the league is our number one priority. We’d like to have a good run in the FA Cup but the goal is the players understand our philosophy and manage the games.